Using AdFlow, the pre-press department gets a tool that helps organize the ad production and keeps track of all numerous files that have to be dealt with daily. It is a small and easily-installed application on the local workstations, making connection to the central AdFactory server. AdFlow's intuitive interface shows the ad creator a list of all the ads that have been booked, with colors indicating their status. This list obviously can be searched and filtered to show only the ads the user needs to see. 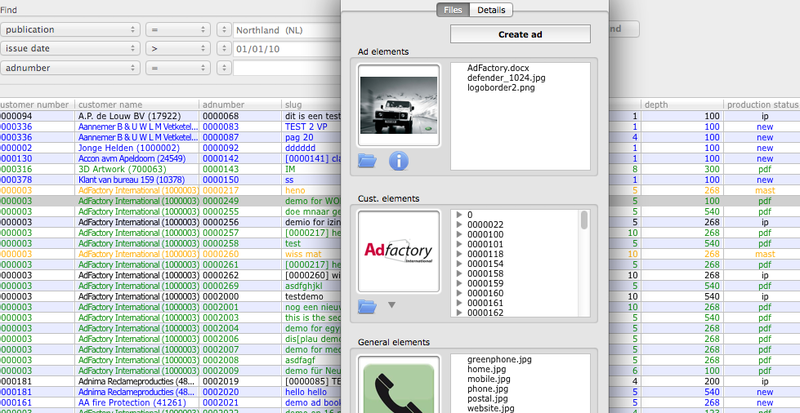 By starting the ad layout, customer's logos and other artwork used for the ad, are automaticaly displayed. As a result there’s no need to search for previous ads, customer logo’s, images etc. on servers or sometimes even in cabinet drawers. Ads are created using Adobe InDesign CS (or Quark Express) which opens automatically in the booked size. Via ‘drag and drop’ from the customer-material-window, the ad can easily and quickly be produced. Even when print ready PDF’s are delivered, AdFlow saves production time; by assigning the material to a booked ad, the PDF is automatically checked for correct size and the production status is immediately changed to join the workflow. To verify wether the ammount of layout work for an ad is in line with its price, AdFlow keeps track of the time spent for producing the ads. AdFlow lets InDesign create the PDF when the ad is ready. Alternatively, ads can be sent to Adobe's Acrobat Distiller for customised PDF creation. There is no risc that ads are accidentally stored in a wrong location; AdFlow takes care of storing in the right folder.